Interview with Ron Goerler, Jr. 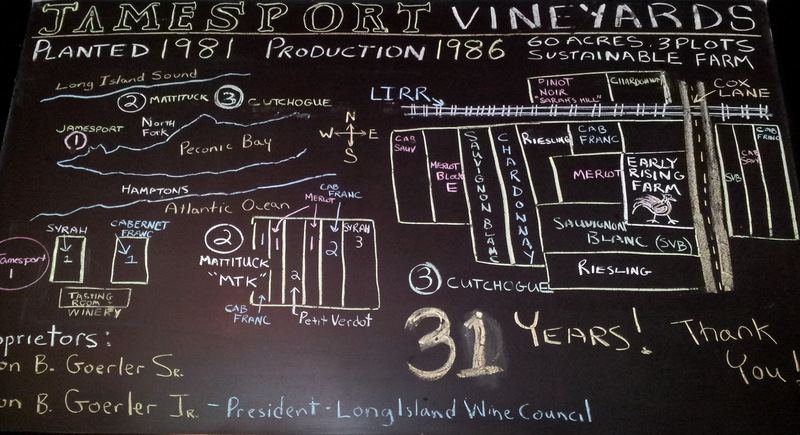 Walk into the tasting room, go up to the bar, and you are confronted not by a list of wines on the board in front of you, but instead an indication of the seriousness about wine that prevails at Jamesport Vineyards: a diagram of the vineyards and the varieties planted. Here the focus is clearly on what matters first: the vineyards where it all begins. Right behind the winery and tasting room, are two lots planted with Syrah and Cabernet Franc. Further east, at Mattituck, are six lots planted with Cabernet Franc, Merlot, Petit Verdot, and Syrah. The largest vineyards are in Cutchogue, where there are fourteen lots in all. The Cabernet Sauvignon is there, as well as Merlot Block E, Sauvignon Blanc, Chardonnay, Riesling, and Merlot; eight different varieties in all, in twenty-two separate lots on three plots. It all adds up to sixty acres that are cultivated sustainably. Our conversation began, not with or about Long Island wines, winemaking, or winegrowing, but with the devastating effects of this past winter up North, in the Niagara Escarpment of both Canada and New York, and Michigan, where the temperatures dropped to minus forty below—so cold that the Great Lakes froze over. What that meant was that there was no moderating “lake effect” to protect the vines. It also meant that there was no heavy snowfall in Syracuse, for example, due to the freezing of Lake Erie. Most importantly, it meant that there was severe crop damage in the vineyards, with as much as 65 to 75% of the vines killed by the cold. Yet, in Long Island, thanks to the surrounding salt-water bodies of the Sound, Peconic Bay, and the Atlantic, the temperatures were effectively moderated by the “maritime effect”, which is to say that large, deep bodies of water that have not frozen over mitigate the cold that prevails in the region as a whole so that the vines—especially vinifera vines—can get through the winter unscathed by the cold, which, when severe, can cause the woody trunks to split open, causing the vines to die. (It did happen in Long Island in 1984, which Ron called a “massacre” of the vines. The Sound was frozen, the Bay was too, resulting in no protection for the vines; it was the worst winter on record.) This year was not as bad, but there was some creek freezing in January, when the lowest recorded temperature was minus five Fahrenheit. In discussing terroir, that wonderfully untranslatable French word, Ron talked about the nature of Long Island’s climate in relation to the vintages. Climate and place are what pretty much define the kind of weather that will prevail in a particular region. Long Island enjoys a maritime climate, which along with the warmer waters that the Gulf Stream brings past, also is prey to some dramatic changes in weather. In 2005, ’07, and ’10, the summers were very warm and the grapes developed beautifully. On the other hand, late rain in 2011 lead to a terrible vintage, which led Eric Fry, winemaker at Lenz, to say of the reds that they “were only good for blending.” Ron agreed and added that at Jamesport the fruit was so poor that they decided to cut down 85 tons rather than make bad wine that would sully the winery’s reputation. 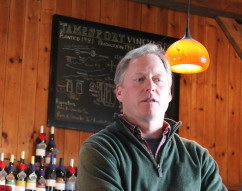 It was a costly decision, but Jamesport’s reputation–as well as that of the Long Island wine industry–was at stake as well. After all, whereas California has had over 150 years to establish its reputation, and European regions have had centuries, Long Island, at barely forty years, still has to be careful about its good name. Ron did make the point that others that chose to make wine in that year may have enjoyed different circumstances in their vineyards. Ron is the second generation in the family to take over Jamesport Vineyards, which was founded by his father, Ron Goerler, Sr., in 1980. He had studied to be a soil scientist but realized that he loved working out-of-doors and decided to return to the winery to do exactly that. The challenge now will be for him to be able to pass the operation over to one or more of his four sons, the oldest of which is twenty. Will any of them be interested in making the commitment? After all, he has five brothers and one sister and none of them have any interest at all. With respect to the commitment, “It’s very much like having a head of cows—whether you’re raising them, feeding them, selling them–whether it’s retail or wholesale–and most important of all, growing them—you have to be there all the time.” Even in the wintertime, when things are quiet at the winery, the vineyard needs pruning and sixty acres of vines can take a long time. The spacing in the vineyard varies. Originally the first vines were planted 9 by 8 feet thanks to the recommendations at the time by Cornell, but all that was later pulled out. Later vines were separated by 7 x 5 or 8 x 5; they just planted seven acres of Sauvignon Blanc 2 years ago at 7 x 5. The winery is the biggest producer of Sauvignon Blanc in LI, which Ron considers his signature wine because the variety does so well here Originally he and his father started Sauv Blanc with just a single clone: Clone 1. The problem with it was that it was a “big, fat clone” from California, very vigorous and wanting to produce big clusters, but it didn’t do that well in a maritime climate like Long Island’s, because it was too susceptible to rot. As Ron pointed out, Sauvignon means “savage.” Now, with less vigorous rootstocks like 10114 or Perrier, they get smaller vines. The new clones come from Bordeaux, such as 316, 317, and the Musqué clone, which was planted ten years ago and is very aromatic; and a clone from Italy; they all produce small clusters. (For a comparison of clonal differences, see “How do Sauvignon Blanc Clones Differ?”— but this is only about the taste of wine made from the clones, not the vegetative differences.) This is similar in effect to the Dijon clones (76 and 95) that they put in to replace the original Chardonnay vines (Wente clones from UC Davis). 30 years ago, one didn’t think about all these clones and their differences—the knowledge wasn’t there and the technology wasn’t either. Many of these clones were only released to the public about 20 years ago, although they had been working on developing these back in the 70s and 80s. In fact, it was just over 30 years ago that Ron and his father, Ron Goerler, Sr., went on a trip to Germany and saw what they were doing in the vineyards there, then came to the realization that training vinifera to high-cordon trellises didn’t make any sense. Top wire, recommended by Cornell, was meant for droopy American and hybrid vines, and not only was unsuited for the vertical growth of the European vines, but it made the work of pruning and harvesting more difficult, given that one had to work at eye-level or above—very tiring on the worker’s arms. It was in 1985 that a very hard winter struck and the trunks of the vines split. It forced the issue of replanting the vines and training them vertically to what is called VSP (Vertical Shoot Positioning), on a trellis with a low cordon at about 35” high. Ron is not only the vineyard manager but also the winemaker—a hat he claimed when his last winemaker departed. I asked him how he’s been affected by being “chief cook and bottle washer” and his quick reply was, “I’ve lost a lot of weight.” While he was president of the LIWC (Long Island Wine Council) he was so busy with issues that he couldn’t effectively focus on his business at the winery, but now that he’s left the position he has the time he needs to really think about it. He travels to in search of new blood and new ideas. In his opinion, if one doesn’t keep on the lookout, not just for ideas but also the people to implement them, one isn’t going to be successful. Holding on to wine inventory is another serious issue for small wineries (every single winery in Long Island is small—even Pindar, which is the largest producer at about 70,000 cases (840,000 bottles). Ideally, a wine is released when it’s ready to be consumed, which is easy enough for whites, most of which aren’t destined for aging but are meant to be drunk young. Red wines are another matter. Again, most reds are also meant to be enjoyed early on after being bottled, but a small percentage are deliberately made for aging, which means that these wines age in oak barrels for a long time and then need further aging in bottle. It is best if such wines can stay on premises at the winery until they are ready for release, say in two or three years, when they are more ready to drink. The problem is that it ties up money because there is no income from wines in inventory. In other words, it costs the winery cash flow. What peeves Ron is that the average tasting room visitor cannot understand that, which can matter if the price has to be set at a point that returns that cost back to the winery’s coffers. So most aged wine has to be more costly to the consumer for that reason along with other important ones, such as highly-selected quality fruit, careful attention in the winery, and time in costly oak barrels. Given the costs involved and the resulting quality, the prices for fine red wines are well justified. The reality is that many of the small businesses in the towns are dependent on the tourist traffic that comes here. When it was just potato farms the season lasted from Memorial Day to Labor Day and that was it. Back in the 80s, when interest rates were up to 19% farmers couldn’t get the loans they needed to keep going and they turned belly up because they had already taken loans before this and couldn’t continue to make the payments. They’d been hoping that the next crop would get them back in the black. But it’s the same with grapes: you have to have a good crop, but you have a year like 2011 and suddenly you have a lot of empty bottles that you can’t fill. Another reason the potato farmers went bust was that they couldn’t see how to convert potatoes to another more profitable product. (It’s only recently that one farmer, on the advice of his children, turned his spuds into chips—which are selling really well all over the Island—while others are having the potatoes turned into spirits at a new distillery, Long Island Spirits, as LiV Vodka. In fact, if a wine doesn’t turn out as it should, it can be taken there and made into a grape brandy. Indeed, Ron has been experimenting with making brandy from his grapes and at present he has a barrel of 180 proof spirit—that’s 90% abv—which he’s thinking of making into schnapps, adding different kinds of different local fruit such as strawberries, raspberries, apple, and so on. There are other issues of concern to Ron. Just a week before our interview, he had returned to LI from a trip to Champagne with Steve Bate, Executive Director of the LI Wine Council , and winemaker Jim Waters, under the auspices of Protect Place (see Edible East End), an organization founded in Napa with the signing of The Joint Declaration to Protect Wine Place & Origin in 2005, which LIWC signed and joined in 2010. Protect Place, the signatories of which also include Rioja, Jerez/Xeres/Sherry, Oporto, Chianti Classico, Bordeaux, and Tokaj among others, is primarily devoted to ensuring that participants do not use terms like Sherry, Chablis, Port, Champagne, etc. as terms for wines not originating in those regions. In fact, Ron said, there remain a few producers on Long Island that still use terms like Champagne (or Méthode Champenoise) and Port. That has to change, but people are resistant to doing that, as they’ve been using such terms for many years. Another issue that is being addressed by Protect Place and many of its members is that of the new .vin and .wine domain names that have been proposed by ICANN (Internet Corporation for Assigned Names & Numbers). Protect Place is firmly opposed to their implementation, on the grounds that these new domains will confuse the public and allow widespread abuse. The 48 member wineries of the LIWC are united in that opposition. Jamesport currently makes six reds and six whites, plus a rosé and a late harvest dessert wine. They offer two ranks of wine, the “crowd-pleasing” East End wines, which include Cinq (a blend of five red varieties) Cinq Blanc (a blend of five white varieties), Chardonnay, and Rosé. The Estate wines include four whites: a Sauvignon Blanc, Chardonnay, Riesling “Trocken” and Riesling Late Harvest; the Estate reds include Cabernet Franc, Mélange de Trois ( a blend of three varieties dominated by Cabernet Sauvignon), Jubilant Reserve (a blend that is primarily Cab Franc), Sidor Reserve (a Syrah-dominated blend), and a Petit Verdot Reserve. Plus a verjus—a non-alcoholic kind of vinegar here made with unripe Riesling grapes. (Old Jamesport Cab Sauvs may still be found, and some Pinot Noir is still around). Cabernet Franc, which Jamestown makes in three styles, is its premier red wine, while Cab Sauv can only be made on warm years because it ripens late, such as in ‘05, ‘07, and ’10. The earlier two vintages which are nearly all sold out, but the’10 is just now on the market. However, Ron wants, in the end, to focus on just three wines: Sauv Blanc, Cab Franc, and Merlot—the most widely planted grape in the region. (They pulled all their Pinot Noir because after twenty years of effort they just weren’t getting the return in quality fruit. In fact, it was costing about $15,000 to work the plot of Pinot, but too often disease would ruin the crop; in the end there was no alternative.) The reason that he currently produces twenty different wines at two different price ranges is to please the crowds that come to the tasting room as well as figure out what they want. The Cab Franc Estate wine typically is aged for 18 months. The 2007 spent nearly two years in oak, and that was the one we tasted. It has about 5% Merlot in the blend. It made me think of a Right Bank Bordeaux—specifically, St. Emilion. The 2007 Jubillant blend was tasting beautifully, made of 68% Cab Franc, 18% Cab Sauv, 18% Merlot, 2.5% Syrah, and 2.5% Petit Verdot—a kind of Bordeaux blend in the 19th-Century style, with the addition of some Syrah. It was softer, with well-knit tannins—a very flavorful, well-balanced wine. We also tasted a 2012 Sauvignon Blanc from a cool vintage, which gave it a grassy flavor and herbal notes, with firm acidity; as Ron says, “a real crowd-pleaser.” He likes to ferment his Sauv Blancs in puncheons so that they get some wood flavoring but not as much as would be imparted by barrels. The 2012, however, was not done in puncheons because of the conditions of that year, so it was done in barrels. The 2013 reserve is sitting in puncheons right now, and will take that classic fumé style that comes from the wood. Ron likes using the puncheons because they don’t impart so much oak, instead allowing the maturing wine to absorb the complexing tones of the wood. A Riesling was poured, and it had a firm acid backbone, bone-dry with plenty of mineral and slate tones to it. This is a wine that is not traditionally seen in Long Island, but there are four acres of it in the vineyard. Ron sees the acidity as holding the wine together as well as balancing it to pair with food. With respect to high-acid wines, Ron said that he’s experimenting with Albariño, of which he as an acre planted that will be ready for next year. This was inspired by Miguel Martín, who was the first to plant the variety in Long Island at Palmer Vineyards, where he’s now had several years of success with it. Ron likes it because it also is an aromatic grape, somewhere between Riesling and Sauv Blanc. A bonus of this variety is that if the crop doesn’t result in a quality varietal wine it can also be used for blending. The point is clear. Jamesport Vineyards is serious about making quality wine and, as a top-rated winery in Long Island it succeeds in doing exactly that. The wines are as honest as the winemaker, Ron Goerler, Jr. That’s very honest indeed. Since the interview in April 2014 Ron has hired a new winemaker, Dean Barbiar, a very talented oenologist who earned his wine education at the University of Maryland and has experience making wine in many corners of the world. Ron is now free to work in the vineyard more given that it’s his true passion. He has also been succeeded as President of the LIWC by Sal Diliberto. Now he can really focus on the business of running a winery. This entry was posted in Vineyards, Viticulture and tagged Dean Babiar, East End of Long Island, Jamesport Vineyards, Long Island Vineyards, Long Island Wineries, North Fork AVA, North Fork Wineries, Ron Goerler Jr., Sustainable Viticulture, Vineyard terroir on 9 September 2014 by JoseM-L.
Really enjoy reading your posts. Especially the North Fork ‘centric ones ! Although somewhat of a proverbial vino novice (well, really more intermediate), I am diving head first into a wine barrel and soaking up as much information and expertise as I muster. BIG Thanks ! Daniel, thank you for your kind words. It’s very nice to be appreciated. I see from your e-mail address and your “InDevelopment” Web tab that you seem to be working on setting up a blog of your own. Please advise me when it’s up. I’d like to see what you write about. Best wishes. I believe it was 1994, not 1984, when the Long Island “Massacre” occurred in the vineyards. 1994 was a very cold winter in the northeastern US — I measured 25 inches of ice on the Hudson River at North Germantown — New York State averaged 4 degrees F below normal during the winter of 1993 – 1994. I restore and sail historic ice yachts that were all the rage on the frozen Hudson River in the late 19th century, and I remember having the unique experience of sailing just north of Croton Point in 1994. Normally this area is ice free due to the huge discharge of warmed water from heat exchangers at the Indian Point nuclear power facility and the normal intrusion of brackish sea water with the twice daily tidal exchange, but the winter of 1993-1994 was so cold that the river froze fast, hard, and clean and afforded us a very rare weekend of beautiful sailing out of George’s Island Park. Great South Bay on Long Island was frozen as well, and there was ice in Long Island Sound. I suspect Peconic Bay was largely frozen that year as well.